This 4.7 mile hike makes a wide circle around the entire Loft Mountain complex. 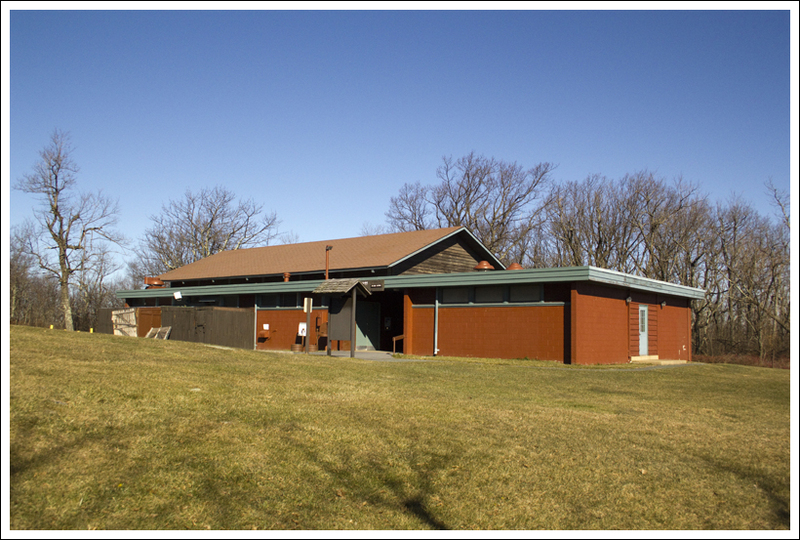 It starts at the wayside and makes use of three different trails in the area – the campground path, the Appalachian Trail and the Frazier Discovery Trail. 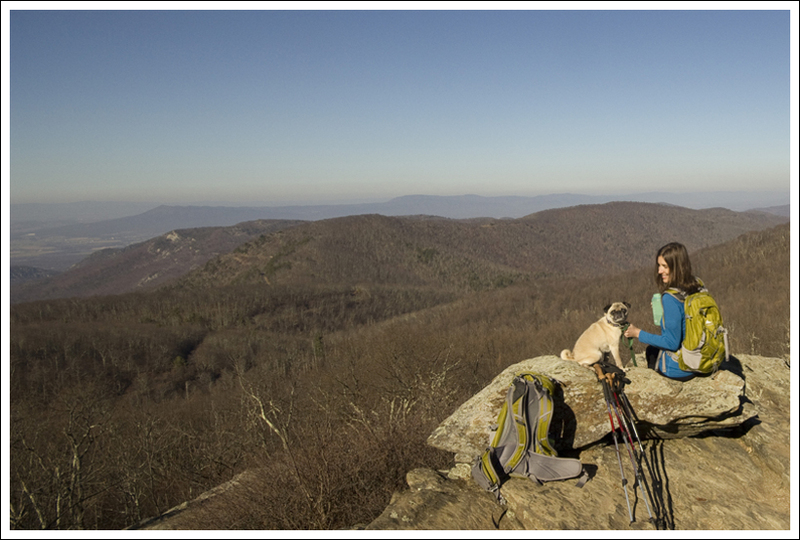 Christine and Wookie enjoy a view along the AT. Below: Wookie enjoyed his outing. So… it’s been a while since our last post. We’ve been sitting on photos and information about our Thanksgiving hike for over two months now. 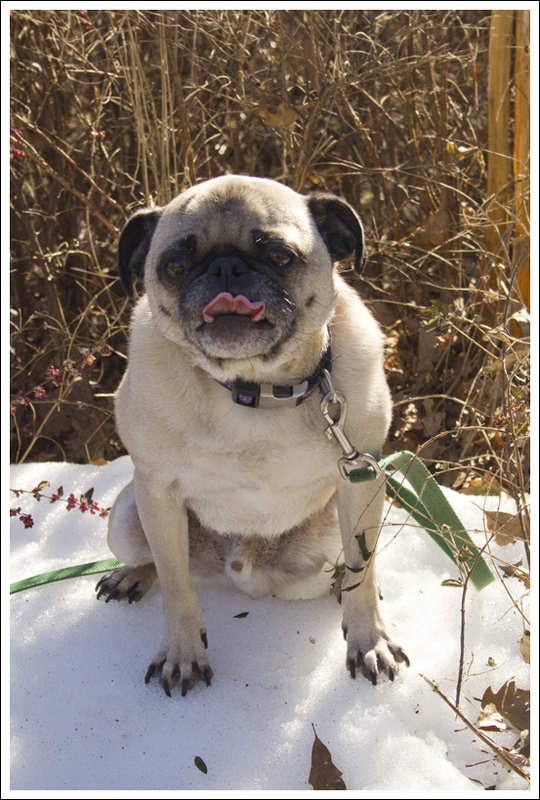 Things got a bit chaotic with the holidays (travel/family obligations), I was sick for a full six weeks, and worst of all we lost one of our pugs (13-year old Mojo) after a short, tough, twelve-week battle with cancer. Things finally feel like they’re getting back to normal again, and we’re hoping to spend some more time on the trail this winter. Maybe even a snowshoeing trip? Thanksgiving this year was a warm, delightful, sunny day. I was at the tail end of being sick , so I waffled back and forth – relax on the couch watching the parade and dog show; or get up, get dressed and go for a hike. 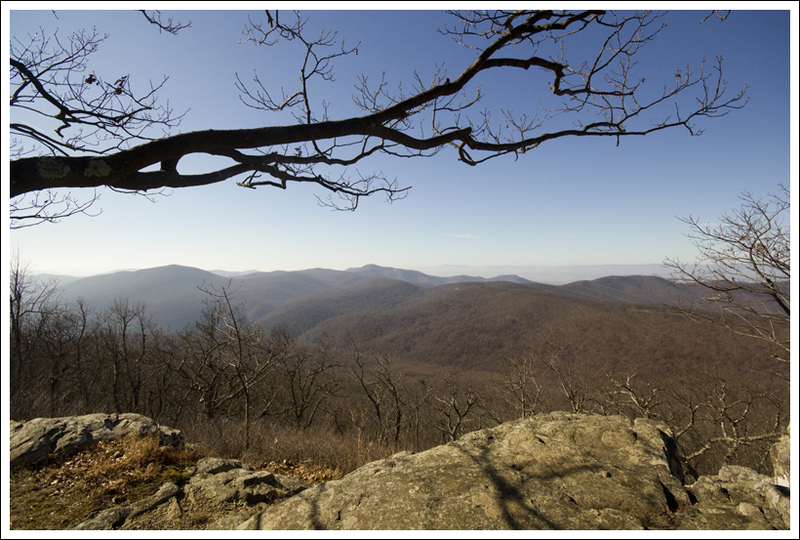 In the end, the beauty of the day pushed me in the direction of Shenandoah National Park. I wanted a shorter/easier hike without much climbing, so we settled on the Big Flat Mountain Loop. This loop encircles the Loft Mountain complex. Here’s a bit of trivia – the campground complex is not actually on Loft Mountain – it’s on Big Flat Mountain – hence the name we’ve given this hike. It’s also the same hike I chose for my annual Father’s Day hike last June. We started off at the wayside and made our way up the crumbling, but still (technically) paved, campground path. The path parallels the road, about 10-15 feet into the woods. 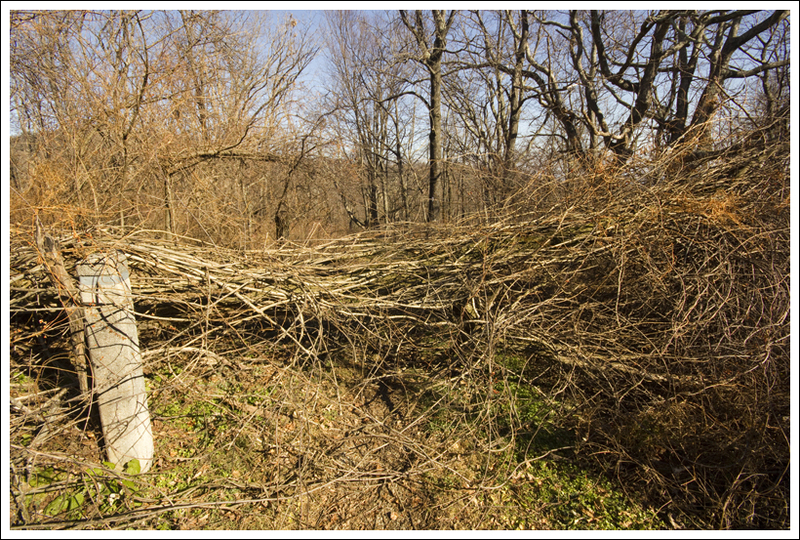 There were lots of downed trees and branches across the path that had fallen recently. Wookie enjoyed getting his leash tangled in just about every obstacle. The camp store stands quiet during the off season. 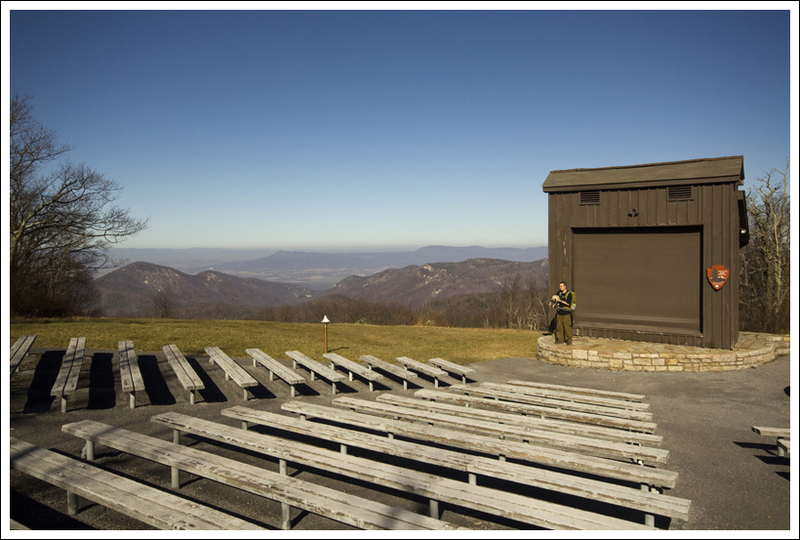 Below: The view from behind the amphitheater; The Loft Mountain Campground Amphitheater. We eventually came up to the camp store/laundry, which was closed for the season. We let Wookie eat some snow and took a few minutes to consult our map to make a few more route decisions. From there, we crossed the road and made our way toward the amphitheater. The amphitheater has a fabulous view of the valley below. It’s definitely worth a short stop along the way. Near the amphitheater, we picked up the access trail for the AT. After a short walk, we turned onto the Appalachian Trail, heading north. The trail makes its way behind the Loft Mountain campground. There are wonderful cliff-side views to the east and several spur trails lead to campsites and the camp store. After passing the campground, there is a short downhill followed by the one semi-steep climb of the loop. This climb, which normally would have been quite easy, almost killed me with my diminished aerobic capacity It always amazes me how quickly one can get out of shape! At the top of the climb, you’ll pass the first junction of the Frazier Discovery Trail. If you take this junction, you miss two of the nicest views on the hike. Continue a short way north, passing two spectacular views to the west. The prominent sloping peak in the distance is Massanutten. At the last view, you’ll see the other arm of the Frazier Discovery Trail. Follow this trail (unless you have a dog with you!) back to the bottom of the mountain and the wayside. 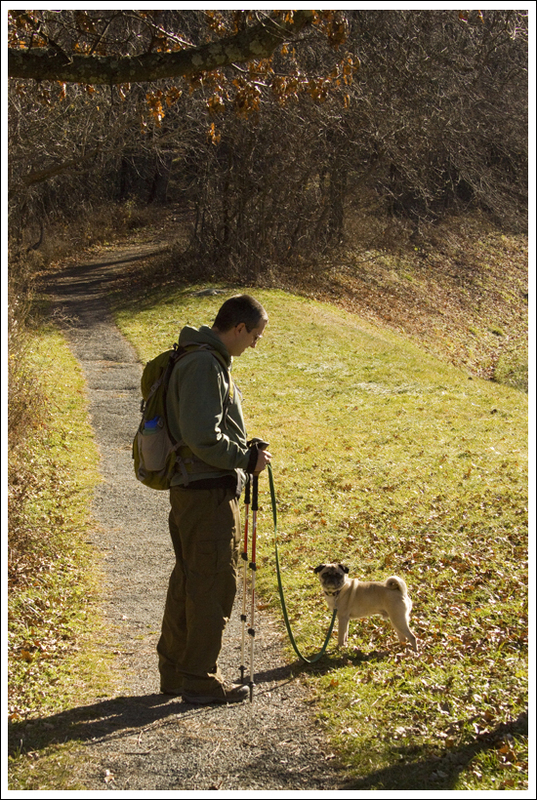 If you do have a dog with you, you should continue north on the Appalachian Trail for almost another mile until you reach the spur trail to the Ivy Creek maintenance hut. Follow that trail back down to the road/wayside. I bring the issue of dogs up primarily because we got in trouble for using a short section of the Frazier Discovery Trail on the return arm of the loop. 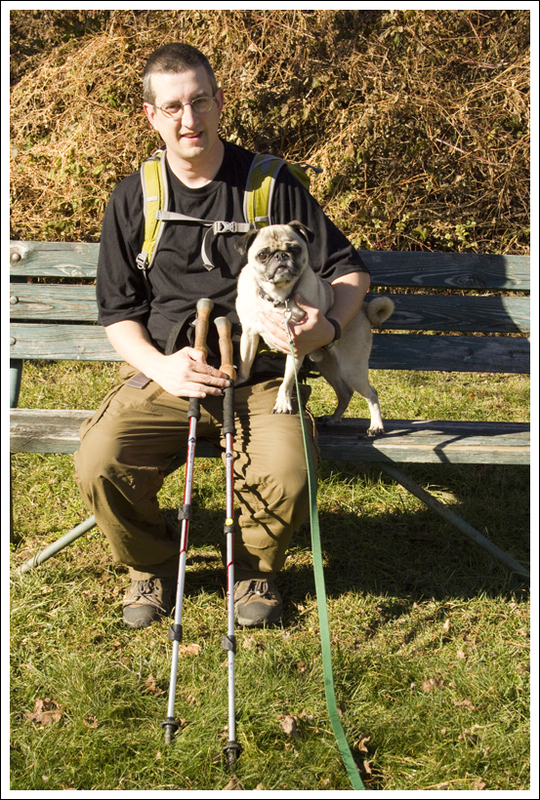 The trail was marked ‘no pets’ – but only at the bottom of the mountain. The spot we entered, at the top of the mountain – along the ridge, was not marked. A ranger stopped us in the wayside parking lot and gave us a warning. It was a nice way to spend the holiday! Christine and I both handle our festivities for Thanksgiving differently than most people. We don’t do a large Thanksgiving dinner with the huge bird, cranberry sauce, stuffing, and all the other side dishes. There is no pumpkin pie or a pulling of a ceremonial wishbone. Instead, we have homemade pizza. Christine isn’t a huge fan of turkey, so we have decided to have something that we both enjoy. We also have started the tradition the last few years of starting the day off with a hike. I definitely feel the touch of a higher presence when I’m communing with nature and there is no better setting to reflect on what I am thankful for in my life. There were quite a few trees fallen across the trail. 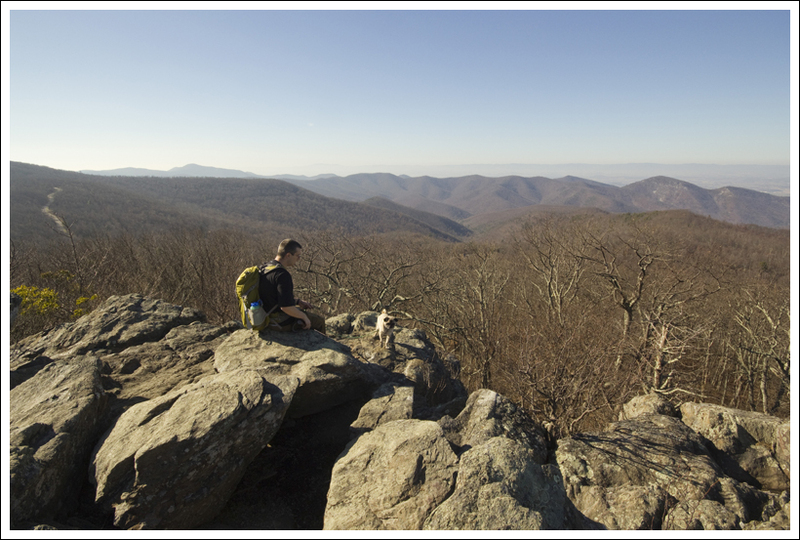 Below: Adam walks along the Appalachian Trail; Views along the hike. With pug in tow, we parked at the Lost Mountain wayside and restaurant. There were only a few cars up here, which is typical of Thanksgiving and some of the colder months, so we knew we were in for a quiet hike. We crossed the road and on the northern end of the parking lot and made our way on the paved walk . After .1 mile, you reach a junction with the Frazier Discovery Trail, but stay on the paved walk. The path is mostly paved or gravel. We did have to hurdle or duck under a few blown trees across the path. Around 1.6 miles, you reach the Loft Mountain Camp Store. From here, we crossed the road and continued on the walkway for .1 mile to reach the Amphitheater. They really picked a gorgeous spot for this structure, since you’ll have marvelous views. I can only imagine watching the sunset during a ranger program for all the people camping overnight. From the Amphitheater, the path begins to go downhill. 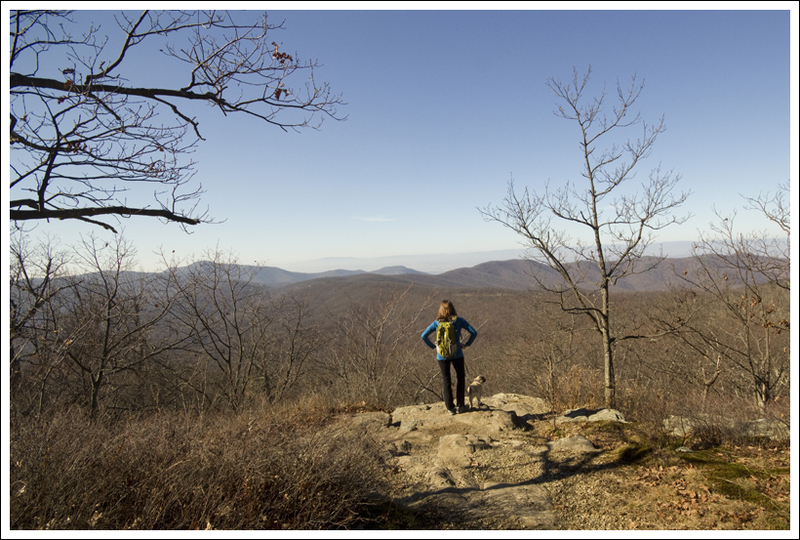 At 2.1 miles, you’ll reach a junction with the white-blazed Appalachian Trail. Head left (going north) from this junction, going uphill along the AT. At 2.4 miles, the AT begins to level out somewhat as you will navigate around the Loft Mountain campground. You may smell hotdogs cooking and see glimpses of people and tents through the trees. 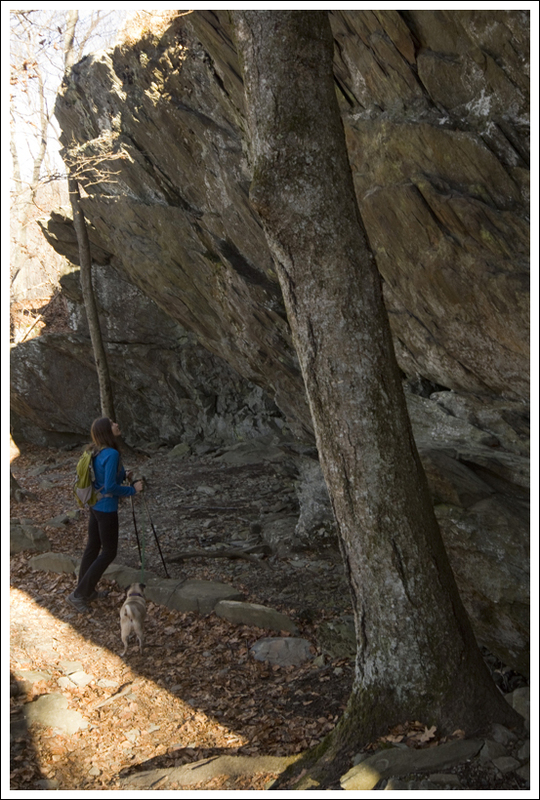 You will pass a few spur trails that serve as access for campers to the AT, but stay on the trail. The trail stays fairly level for a while. At 3.6 miles, you will reach the first junction with the Frazier Discovery Trail. Stay straight on the AT and you will come to your first great view past the junction. 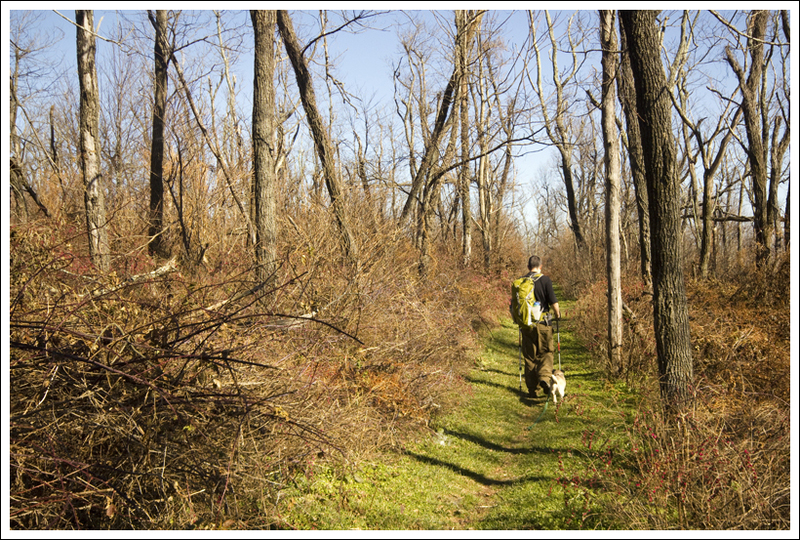 Continue on the AT and at 3.8 miles, you will reach the second junction with the Frazier Discovery Trail. Take a left on this trail and you will immediately come up to another view. Follow this steep downhill path and at 4.6 miles, you will reach the junction again with the paved walk. Take a right and you will return to your vehicle at 4.7 miles. 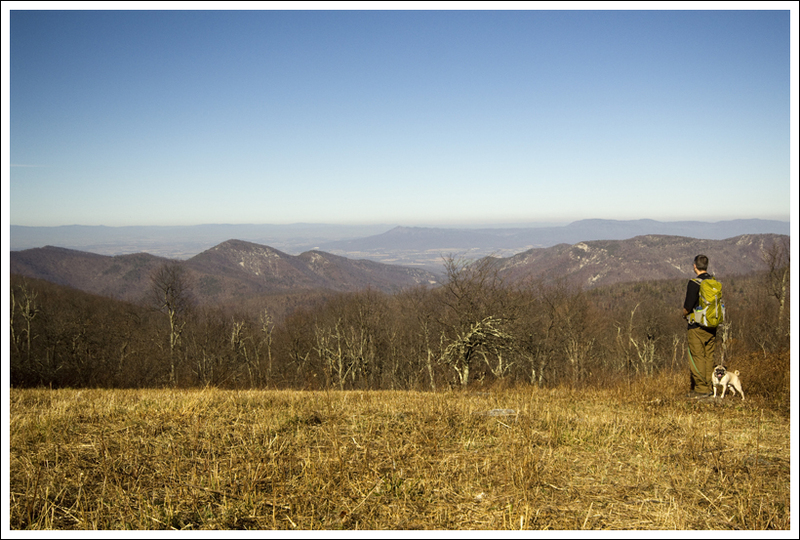 Thanksgiving day view in Shenandoah National Park. Below: Cliffside on the Frazier Discovery Trail. So, as we were hiking along, we typically like to reflect with one another for what we are thankful for. We both were reflecting how thankful we were for each other, our family, our dogs, our jobs, our health, and our ability to share our love for the outdoors together. Our hearts were a little more somber this day, since we had just recently received the bad prognosis for Mojo. We’ve had him for most of the time we’ve been married and we give so much love to our pets, that are key members of our family. We have lost Mojo since then, but he is forever in our hearts and we know he is in a more pleasant place now. Hiking is a large metaphor for life, as you have some steps that are harder than others and stumbles along the way. We have our love in our hearts to serve as our trekking poles to keep us balanced and help us reach the vistas along the way. I have to say… this was not one of my better hikes. I accidentally broke SNP’s rules, and I feel really bad about it. But, in my defense, if the park doesn’t want dogs on a certain trail, they really should mark it ‘No Pets’ at both the start and the end of the trail. Because I entered the Frazier Discovery from the AT, I had no idea I wasn’t allowed to be there. The only sign indicating the rules was posted at the bottom of the mountain – way at the other end of the trail. Thankfully, the park ranger at the Loft Mountain wayside let me go with a warning. I also came home with THIRTEEN ticks, even though I use a preventative. Hopefully, I won’t get Lyme disease again. Despite the challenges and pitfalls, I still enjoyed being out on the trail. Difficulty – 1.5. The trail is gentle and rolling with only a couple very moderate climbs and descents. Trail Conditions – 4. The trail was in excellent shape. There was a little snow still on the ground in a few spots, but nothing that caused us trouble. Views – 4. There are many excellent views to both the east and west along this hike. Wildlife – 3. We didn’t see anything on this hike, but there are bears, deer, birds and other small creatures in the vicinity. Ease to Navigate –3. You’ll have several different options for turns on this loop, but as long as you don’t go south instead of north on the Appalachian Trail, you shouldn’t get lost. Solitude –2. The trails in this area are heavily trafficked, so expect to see other hikers. Park at the Loft Mountain Wayside at Skyline Drive mile marker 79.5. Walk north along the drive for a 150 yard and then cross the drive to pick up the fire road. The trailhead is almost directly across the drive from the Patterson Ridge trail. Well, look at all that green grass and snow-less trail. I’m kinda jealous.